It is usually the simplest treats that are my kids’ favorites. 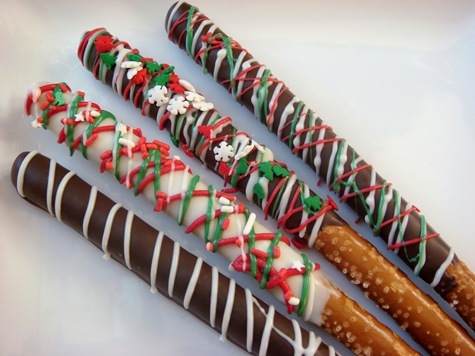 These chocolate covered pretzels definitely fall into that category. They are easy to make, and fun for kids to help with. Adding the sprinkles is a coveted job in our kitchen. For easy dipping, pour melted chocolate into a tall narrow container, like a drinking glass, wide mouthed canning jar, or a Pyrex measuring cup. For easy cleanup, line your glass or jar with a Ziploc bag. Fold the top edge of the bag back over the lip of the glass. When you are done, just throw the bag away: no scrubbing chocolate out of the glass. Melt chocolates using a double boiler (or melt slowly in the microwave). For easy dipping, pour chocolate into a tall narrow container, like a drinking glass, wide mouthed canning jar, or a Pyrex measuring cup. (For easy cleanup, line your glass or jar with a Ziploc bag. Fold the top edge of the bag back over the lip of the cup) Use a spoon, if needed to coat about 2/3 of the pretzel rod with the chocolate. Place dipped pretzel on a sheet of waxed paper. Drizzle with contrasting colors of chocolate, if desired (for easy drizzling, use a squeeze bottle, or a Ziploc bag with a hole poked in one corner). While chocolate is still wet, garnish with sprinkles. Let dry completely before storing. 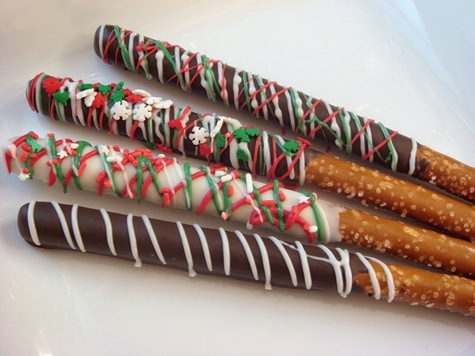 Love how festive you made these with the different sprinkles! Thanks for sharing.